Their sharply curved screens wrap your games around you to provide a more enveloping viewing experience. Advance your gaming setup forward with a Predator Z1 curved monitor that's the right size for you, 27", 30" or 31.5". NVIDIA® G-SYNCT creates smooth gaming experiences by syncing frames rendered by your GPU to the refresh rate of your monitor, eliminating screen tearing and minimizes stuttering. 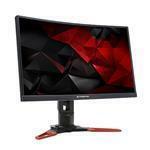 Rapid 200Hz2 refresh rates speed up the frames per second to deliver ultra-smooth 2D motion. Fast 4ms response times render fast-moving action or scene transitions smoothly without blurring or ghosting. WFHD (2560x1080)2 resolution lets you enjoy crisper visuals with more details. These monitors deliver 100% sRGB coverage for perfectly recreated colors. Meanwhile you'll see everything clearly from any position with 178° wide viewing angle technology. Stay in the fight for hours with Acer VisualCareT technologies, including Acer Flicker-less, BlueLightShield, ComfyView and Low-dimming technologies.